“Las Ramblas” depicts a Sunday afternoon on the famous boulevard in Barcelona. My great-aunt Detty, Benita (McGinnis) McCormick, painted this as an ode to the year long sojourn she and my great-uncle Phillip McCormick spent in Barcelona. Oil on canvas, 1970. Those of us who loved them during their 50-plus years of marriage knew that of the countless places around the globe they had visited, nowhere else resonated with Aunt Detty and Uncle Phil more than that captivatingly proud, complex, and progressive land of Gaudì, Dali, and Picasso. Barcelona was many things to Phil and Benita. It was a retreat that offered them respite from the pangs of separation as they watched their children become adults and reclaimed their own lives. It was a haven of inspiration, offering new ideas and methods of expression to an artist and an art lover who welcomed growth and new ideas. And it was a seat of romance, where Arab and Roman influences danced gaily with the Catalan culture and rekindled their passion for life and each other. As time passed, all it took to elicit a nod and a knowing smile was for one of them to repeat that storied phrase, summoning in an instant those memories of their glory days in Barcelona. In 1970, some ten years after their extended stay there, Aunt Detty painted a tribute to the city that stole their hearts. 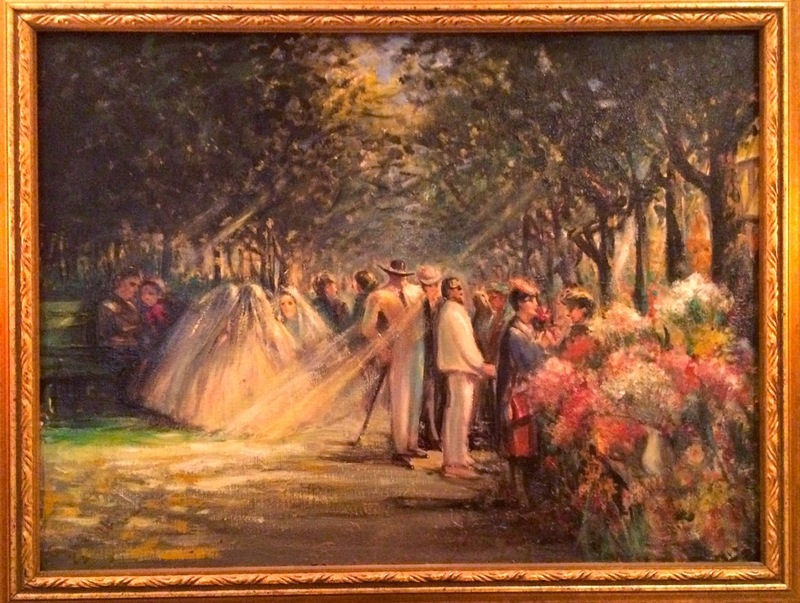 Titled “Las Ramblas,” it is an 18″ x 24″ oil on canvas depiction of various groups of people, from lovers on a park bench to little girls in their First Communion veils and dresses to their parents gathering with their families on the famous Barcelona boulevard on a sunny Sunday morning. Their daughter, Jane (McCormick) Olson, gave me the painting many years ago. A couple of years before she died, she gave me another, smaller painting, this one a watercolor, of the same boulevard. It seems that Aunt Detty had painted it first but was not entirely happy with the result, so she stored it away in a trunk for many years. Both paintings hang on adjacent walls in our family room. First Communion Sunday, the watercolor above, focuses on a group of little girls right after their First Communion and is reminiscent of the motion and pattern of an Edgar Degas ballerina portrayal. Unlike its later version, Las Ramblas, its mood is brighter and more impressionistic by way of its lightly-brushed figures and pastels. The day feels warmer, hot even, with a flat light on the ground and surroundings. By contrast, Las Ramblas has a more complex combination of shadows and light. The time of day seems later than the one in the watercolor. There is more subtlety in the details and gradation in the colors, with just a hint of a light blue sky beyond the sunlight-dappled canopy of trees. The activity is more varied; while the little girls first catch your eye, your find your gaze traveling diagonally toward the flower stand in the lower right hand corner, up to the center where the men in white suits stand as their wives talk, and then finally resting on the young people on the bench who seem oblivious to everything but each other. I have always loved this painting the most of all my aunt’s works. Every time I look at it, I wonder about the stories behind the people and marvel at how they seem so connected. Though I have yet to visit this charming city, still I am drawn into its busy, charismatic boulevard where untold surprises await. I can almost hear the lilt of my aunt’s voice beside me as I weave my way through a sea of faces and a cacophony of sounds – life at its best. Thanks to Aunt Detty, we too, will always have Barcelona. Thank you for your kind words, Marian! Oh, Linda, your aunt's paintings are wonderful! There must be quite a draw to Barcelona. I once knew a woman (German) who was raised in Barcelona because that's where her family wanted to live. Another friend of mine had a daughter who always wanted to live there–a dream she accomplished in her twenties, living there for a full year, some time after graduation from college. I hope you, too, make it to Barcelona soon–while maybe not for an entire year, at least for a brief visit! These paintings are just wonderful! What treasures to have on your walls. I do love the bright colors of the second painting – so vibrant and full of energy. Back in the 70s, I visited Madrid and the city and province of Huesca (ancestor hunting even then), just bordering Catalonia. So close, yet so far away! It is definitely on my list for next time. So glad you stopped by, Jacqi! So glad you like them, Kathy! I think my aunt would have been tickled to think so many people loved her work, too.